with Peace Activist and Editor Emeritus at Resurgence, Satish Kumar. Modern life is often highly complicated. To live simply we need imagination and creativity. Former Jain monk and long-term peace and environmental activist, Satish Kumar explains why economic growth based on materialism is unsustainable. In his unique and highly inspiring manner, he shows how we can all embrace a life of elegant simplicity. 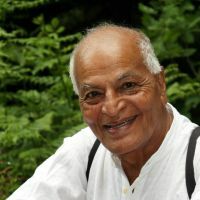 A former monk and long-term peace and environment activist, Satish Kumar has been quietly setting the global agenda for change for over 50 years. He was just nine when he left his family home to join the wandering Jains, and 18 when he decided he could achieve more back in the world, campaigning for land reform in India and working to turn Gandhi’s vision of a renewed India and a peaceful world into reality. Inspired in his early 20s by the example of the British peace activist Bertrand Russell, Satish embarked on an 8,000-mile peace pilgrimage. Carrying no money and depending on the kindness and hospitality of strangers, he walked from India to America, via Moscow, London and Paris, to deliver a humble packet of ‘peace tea’ to the then leaders of the world’s four nuclear powers. In 1973, Satish settled in the United Kingdom taking up the post of editor of Resurgence magazine, a position he has held ever since. His autobiography, No Destination, first published in 1978, has sold over 50,000 copies. He is also the author of You Are, Therefore I Am: A Declaration of Dependence,The Buddha and the Terrorist and Earth Pilgrim. In 2008, as part of BBC2’s Natural World series, he presented a 50-minute documentary from Dartmoor, which was watched by over 3.6 million people.